Black vultures are native to Kentucky and in the last ten to twenty years, their population numbers have increased to the point where they are common across much of the state. Vultures take advantage of the resources available to them, and unfortunately this behavior sometimes involves livestock. In general, vultures tend to feed on the softest tissues first because of ease of feeding; the eyes, tongues, and hind quarters are typically missing from whatever they have been feeding on. ​ Vultures are protected by the federal Migratory Bird Treaty Act of 1918. Under this act, the birds, their nests, and their eggs cannot be killed or destroyed without a Migratory Bird Depredation Permit. It is perfectly legal, however, to harass vultures and use effigies to scare them away. An effigy is a dead or fake dead animal that is hung in an area to deter that specific species from congregating. When displayed properly, effigies are extremely effective at deterring black vultures from using an area. To learn more about black vulture damage control, click the link below to download the University of Kentucky Forestry publication by Matthew Springer. second person helps during the mat cutting steps. For complete instructions and schematics, click the link below to download the University of Kentucky Forestry publication by Matthew Springer and Jonathan Matthew. 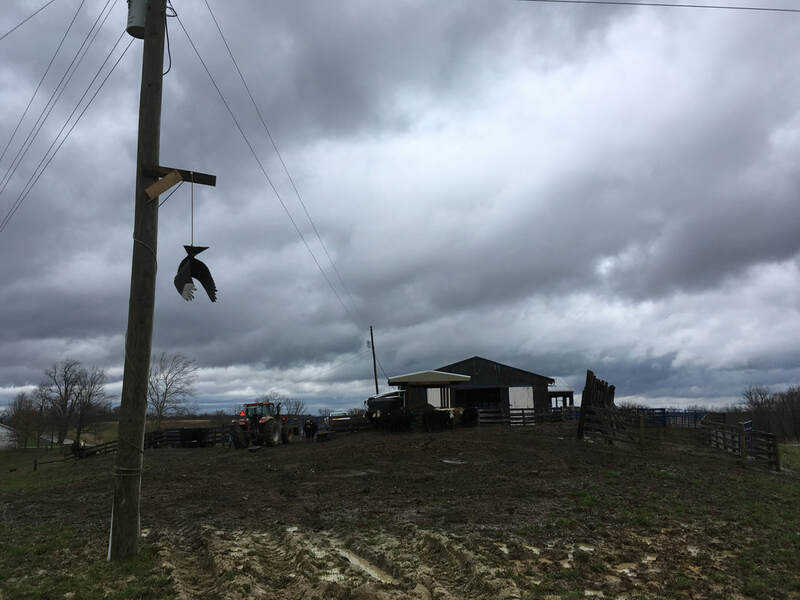 Thanks to the help of the University of Kentucky Department of Forestry and Natural Resources, Eden Shale Farm was able to try out one of the black vulture effigies (a replica of a dead black vulture). Vultures have a strong sense of mortality and if they see one of their own dead somewhere, they tend to leave that area alone so that they too don't have the same fate. Below are images of the black vulture effigy made at Eden Shale Farm. To continue reading the blog post about our effigy, click here.